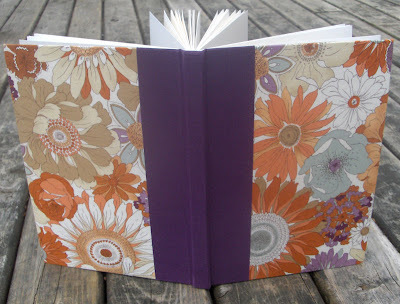 The next swap book to be featured is from Celine, of AlternativeJournals.Etsy.com. She says that "the first thing that comes to mind when I look at this book is 'two-stick' popsicles, the ones you can break apart and share with a friend." 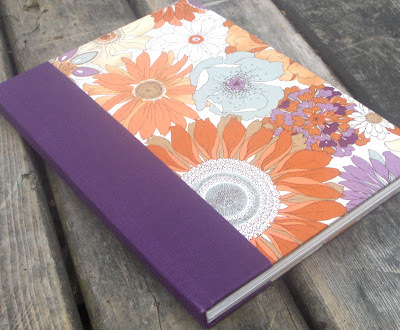 The floral fabric on the cover is a vintage Japanese reproduction print, paired with purple bookcloth to make this pretty casebound book that is so reminiscent of grape and orange summer treats! Visit AlternativeJournals on Etsy to see more of Celine's books. See all the books from Book Swap #7. Nice book! - The whole of the book, the combination of colors and materials, and format looks well composed! This book is certainly not perfect bound. A perfect binding is not sewn. A perfect binding is when you have a stack of loose single sheets and you paste it along the spine so the paste is the only thing holding the pages together - like a supermarket paperback. Case Binding: The cover of a book that consists of two boards, an inlay for the spine, and covering material. The case is usually made separately from the text block and later attached to the text block.